SERIOUSLY?! That is maybe the most disgusting thing I have ever seen. I immediately called the front desk and asked for a new room - after all, I wanted a king anyway. They told me that they were full and that they could send someone up to clean the toilet. At this point, I was still hoping that it was an older toilet that was stained and could not be cleaned, and I was trying to give them the benefit of the doubt. True to their word, they sent someone up to clean it, and it came right off. Which means THEY IT WASN'T CLEAN IN THE FIRST PLACE. This, coupled with the fact that in my inspection for bed bugs I found that the fitted sheet on one of the beds was turned inside out (yes, I check for bed bugs...doesn't everyone? ), had me burnt. slap. up. I mean, did they even clean this room?! What if they just turned the sheet inside out insead of actually changing it? PLUS , not that I am overly dramatic but I am pretty sure there were makeup stains on it. NASTY. After the toilet was cleaned, I probably would have given up and braved the dirtiest hotel room ever for the rest of the week were it not for my co-worker, Emily, whom I had called in for a second opinion and was helping me handle the situation. Together we decided that this was still totally unacceptable, so I went downstairs to show my picture to the front desk, and what do you know, another room opened up. I am a little annoyed that they did not offer me any extra points or free nights, so I think I'll write a letter tomorrow. Is this the most disgusting thing ever, or what?! What would you do if it were you? Either way, it is totally unacceptable for the amount being paid per night. I do not think I'll be staying in this hotel again! Twelve week update to come tomorrow, so come back then! 8/2 UPDATE: The room I was moved to is right beside the room with the nasty toilet. 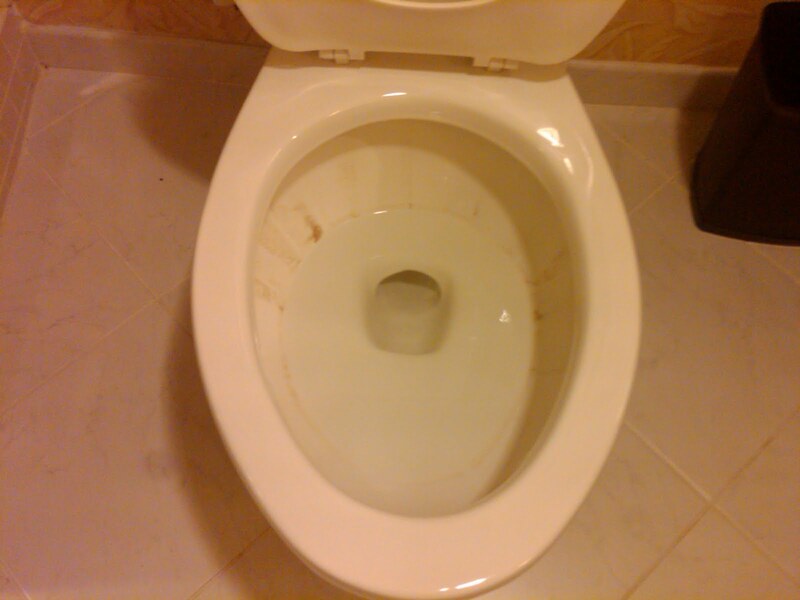 When I was moved last night, the hotel staff said they'd clean the nasty toilet room. I think they lied, because when I walked by this morning there was a privacy sign hanging on the door...which means THEY PUT SOMEONE ELSE IN THAT ROOM! I am so disgusted! Oh the joys of traveling for work and the 5-star hotels they put us up in. Sigh.